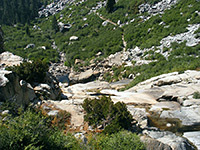 The short trail to Tokopah Falls makes a pleasant change from most paths in the Giant Forest area of Sequoia National Park, which pass through dense woodland with only limited views of the wider landscape, as it traverses quite open ground alongside the Middle Fork of the Kaweah River, ending at the foot of a lengthy series of cascades at the head of Tokopah Valley, enclosed on three sides by steep, treeless granite slopes. In spring and early summer the raging river forms a staircase-like waterfall over a distance of about half a mile as it drops by 1,200 feet, though later in the year the flow lessens to a mere trickle, once all the mountain snows have melted. 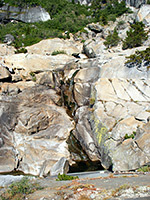 The hike is still worthwhile in late summer, however, passing floral meadows and swimming/paddling pools along the river, while climbing 560 feet over 1.7 miles to the base of the falls, above which the river flows gently over the steep granite hillside above, its waters splitting into several narrow streams to form nice patterns on the greyish white rocks. Because it starts next to the main camping area in the national park (Lodgepole), the path is often rather busy. 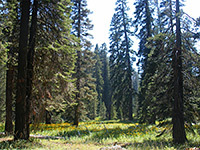 Parking for the hike is at the large lot in the middle of Tokopah Valley, adjacent to Lodgepole campground and the Walter Fry Nature Center. 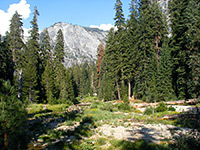 The path begins a little further along the road, across a footbridge over the river; one route (Twin Lakes Trail) heads northwest up the side of the valley while the Tokopah Falls Trail follows the river eastwards. This section of the Kaweah has quite deep pools between smooth granite rocks, popular locations for sunbathing or swimming and splashing in the cool, clear water. On the far side, the campground extends some way upstream, and several sites have favorable positions right on the river banks; it seems that some people spend all day here, relaxing by the water. The path stays close to the river for a while, crossing bushy, grassy land dotted with glacial boulders, before moving away and entering more wooded terrain. The hills enclosing the valley become steeper, especially to the south, and layered granite cliffs are visible through gaps in the forest, together with less frequent glimpses of the rocky river. 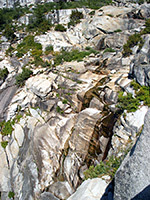 After 1.4 miles the Tokopah Falls Trail crosses an area of jagged white boulders (home to an active marmot population) resulting from a recent rockfall, then descends slightly to a viewpoint next to the large pool at the foot of the cascade, where the hike ends. A sign warns of the dangers of trying to continue upstream, though this is not too difficult, at least not in summer when the rocks are dry, by climbing the bushy hillside a little way to the north and traversing back to the brink of the lowest stage of the falls (a cliff about 50 feet high), followed by other short scrambles alongside the smaller falls beyond; above the final drop are many more cascades, and nicer pools. 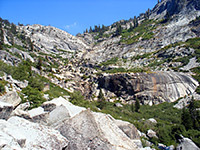 Tokopah Falls can also be seen from a distance via the Lakes Trail starting at Wolverton.